An essential on our Christmas dinner table – and indeed with any roast dinner, these Roast Parsnips with Honey and Thyme are super easy to make and taste incredible! What are your essential Christmas dinner vegetable dishes? For us it has to be roast potatoes, sprouts, braised red cabbage, carrots and, especially, roast parsnips! Roast parsnips are the one dish I KNOW will get eaten, no matter what. We all LOVE them, but especially my little boy who absolutely adores them. In fact, you have to be quick with him around or you don’t get any!! Having a small boy who really loves roast parsnips means I have had a lot of practice – and I’m pretty sure I’ve sussed out the perfect way to roast parsnips. It all starts with cutting them – you want to cut parsnips for roasting so they are all a similar size and shape. This means you don’t get some burnt and others still half raw. However, this can be tricky given their tapered shape! The way I do it is to select medium sized parsnips (so much easier if all the parsnips are all roughly the same size) and cut them in half widthways. The top half I cut into 4 lengthways and the bottom I cut into 2 lengthways – this creates 6 roughly equal sized parsnip batons, which will roast beautifully. Once you have perfectly shaped parsnips, all you need to do is roast them. 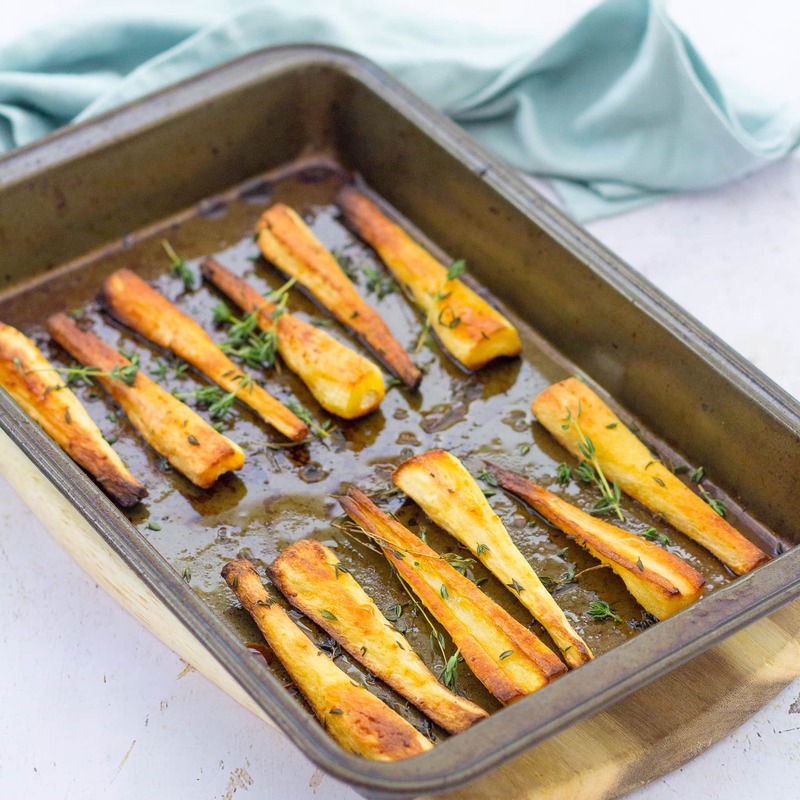 I find the best way to roast parsnips is to toss them in a small amount of olive oil, salt and pepper – then roast them for 25-30 minutes in a hot oven, turning once to ensure they get cooked evenly. One super important factor in ensuring roast parsnip perfection is to make sure the parsnips are well spaced out in the roasting tray. Ideally none of the parsnips should be touching each other and definitely don’t have more than one layer! 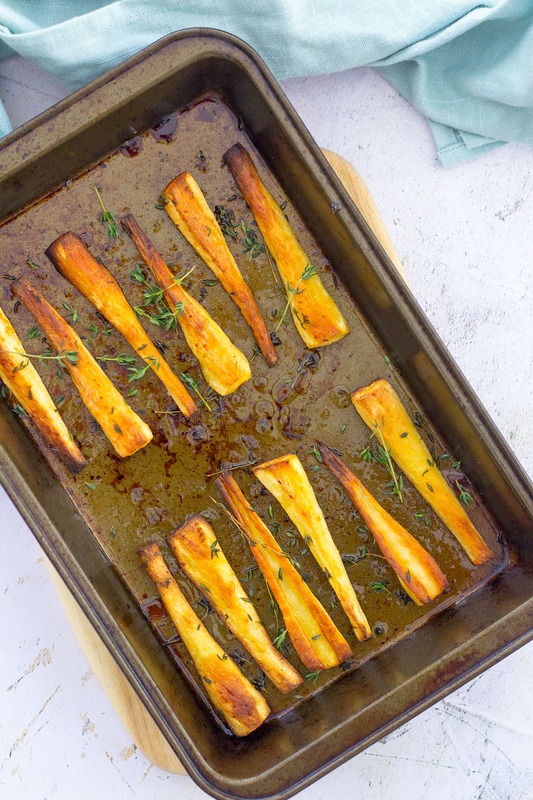 Otherwise the parsnips will steam rather than roast – resulting in soggy soft parsnips, not crispy roasted ones! I’ve experimented a little with this and I find roast parsnips cook best at 220C (200C fan / gas mark 7 / 425F). It does depend a little on how big you cut them of course, but I find that parsnips actually cook quite quickly in the oven and so if you cook them at lower temperatures, they are fully cooked before they have a chance to go all crispy. Again resulting in soggy, mushy parsnips – not crispy crunchy ones! Should you parboil roast parsnips? In a word no! Roast parsnips do not need par boiling. If you do, you will find your parsnips will end up more steamed than roasted. They don’t taste nearly as nice and the texture is soggy rather than crispy. If you cut your parsnips into batons and cook them on a reasonably high heat there is no reason to par boil them. In my opinion, roast parsnips are lovely just as they are roasted in just a little oil, salt and pepper. But if you want to take things up a notch then there are lots of flavours you can add to make them even more delicious – for example a honey, maple syrup, mustard, or one of my all-time favourites honey AND mustard (check out my Honey Mustard Roast Parsnips recipe). You can also add spices, such as cumin, coriander, cinnamon – like I have in this roasted roots recipe. And herbs, such as thyme, sage, rosemary, all work very well with parsnips too. And of course, garlic and chilli – which go with nearly everything – also pair well with parsnips! This combination of honey and thyme with parsnips is a real winner, however. Honey roast parsnips is such a classic, but adding delicate, fragrant thyme into the mix just kicks it up a notch – as well as looking super pretty at the dinner table. Plus this Roast Parsnips with Honey and Thyme recipe has the added bonus that, not being too outlandish, my kids didn’t notice I’d done anything especially different, and happily wolfed them down – HOORAH! One of the problems with honey roast parsnips – or indeed honey roast anything, is that honey has a tendency to burn long before the rest of the food. I wince at recipes where they suggest putting the honey in at the start – this is truly a recipe for disaster! To ensure honey roast parsnip perfection, simply cook your parsnips without honey for the first 20 minutes, then drizzle with honey and return to the oven for the final 10 minutes. 10 minutes is just enough time for the honey to caramelise slightly, but not long enough to burn – perfect! The thyme, however, you want in right from the start – the thyme won’t burn and the longer it spends with the parsnips the more of that delicious herby flavour will transfer itself into the parsnips. 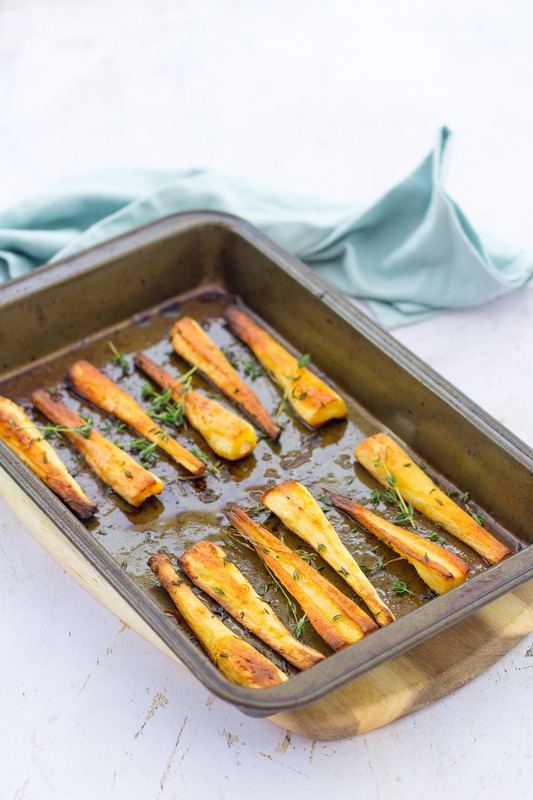 I also like to sprinkle over extra thyme when serving these Roast Parsnips with Honey and Thyme – partly for the taste, but mostly because it looks really pretty! Well, for the reasons I explained above, this isn’t really a problem in our house! But if parsnips are less popular in your house, I have a couple of ideas for your leftover roast parsnips! Alternatively, you could add your leftover roast parsnips to these delicious sprout and potato cakes, which can be made using any vegetable leftovers from your Christmas meal. Perfect Roast Turkey – The Stress Free Way! 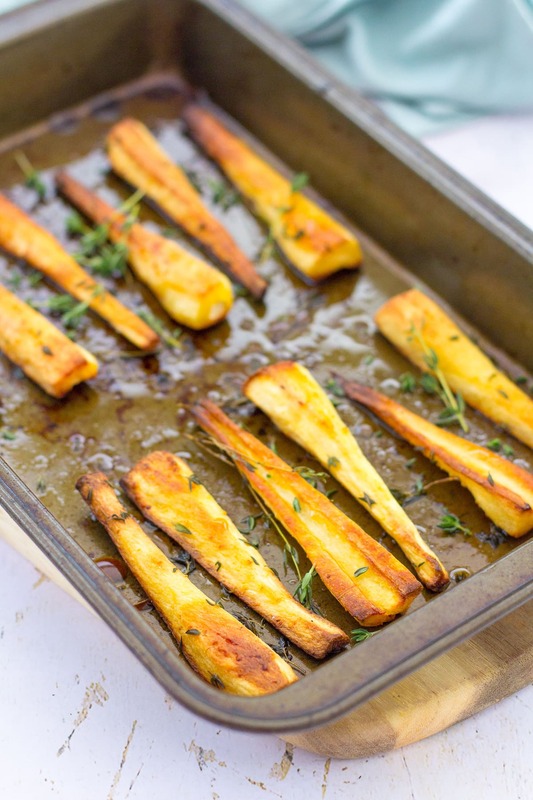 Place the prepared parsnips in a shallow roasting tray and drizzle with the olive oil. Add some salt and pepper and then scatter over the leaves of the thyme. Toss everything together, so the parsnips are well coated, then arrange in one layer (see notes). Place the parsnips in the preheated oven and roast for 20 minutes. After 20 minutes remove from the oven, turn all the parsnips over, then drizzle with the honey. Return to the oven for a further 10 minutes or until the parsnips are golden and crispy and just starting to go brown at the edges. Remove from the oven and serve scattered with a little more thyme for garnish. 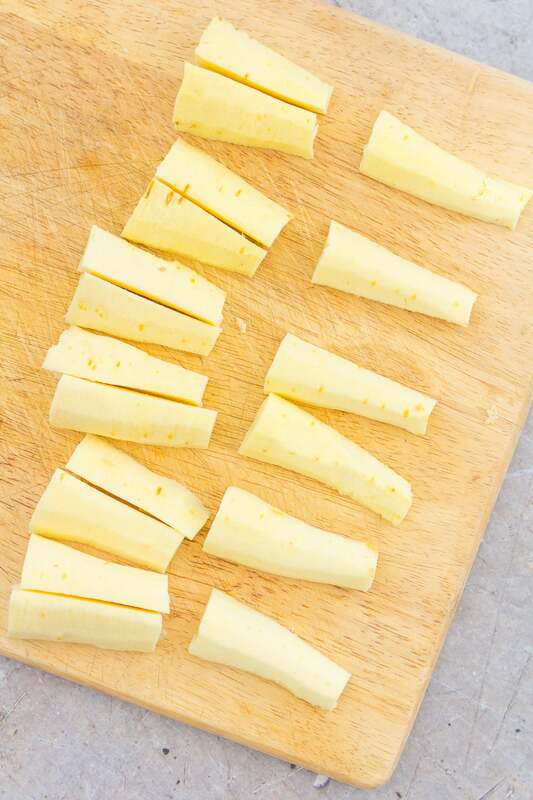 (1) To cut parsnips into 6 equal sized pieces, first cut them in half widthways. Cut the top half into 4 lengthways and the bottom half into 2 lengthways – this creates 6 roughly equal sized parsnip batons, which will roast beautifully. (2) One super important factor in ensuring roast parsnip perfection is to make sure the parsnips are well spaced out in the roasting tray. Ideally none of the parsnips should be touching each other and definitely don’t have more than one layer! Otherwise the parsnips will steam rather than roast – resulting in soggy soft parsnips, not crispy roasted ones! 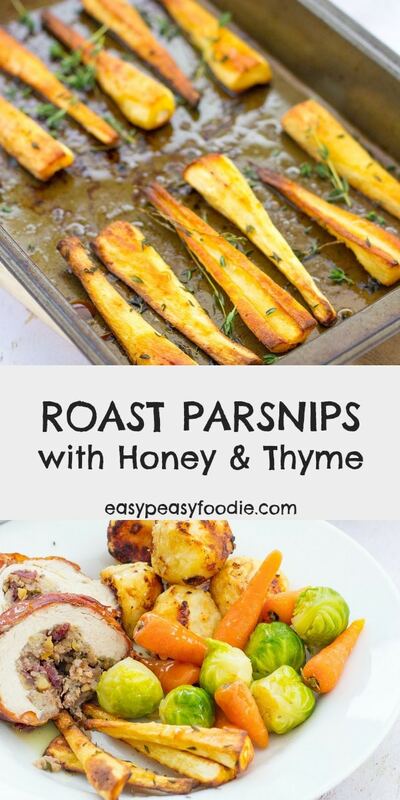 Ohh I love roast parsnips with honey and thyme I bet they taste just wonderful. I could eat all of the ones on your tray myself. Luckily (for me), my lads don’t like roast parsnips so I often get to eat most of them and just toss MR B the odd one to keep him happy. Thanks for linking this to #CookBlogShare. I love roast parsnips too. I recently had a conversation with a group of friends who all swore you have to par-boil them so it’s good to find someone else who doesn’t!